The demands of motorists are always changing. Where once the station wagon was the model of choice for families, the SUV quickly replaced it. Now shoppers in urban environments often want something a bit more compact in order to navigate city streets, but without giving up cargo space. This is where models like the new 2018 Nissan Kicks come in. Shoppers in Glendale Heights IL are often concerned about driving in Chicago, so it only makes sense to want something small and efficient, like this new CUV. What do you need to know about the Nissan Kicks? New for 2018, the Nissan Kicks is a modern replacement for the Nissan Juke. The model offers a fresh style that falls in line with the Nissan DNA, most notably with the VMotion grille. The new CUV comes standard with automatic emergency braking to help with the chaos of busy street, with an efficient 1.6-liter 4-cylinder engine to help save on fuel costs. Set to hit dealerships in June 2018, the Nissan Kicks is a CUV that’s designed for the unique needs of city drivers. Rather than assuming that everyone looking for a higher ride height is seeking outdoor adventures away from the hectic metropolitan world, the Kicks is built for it. The 1.6-liter 4-cylinder engine delivers 125 horsepower and 115 pound-feet of torque, which is paired with the Xtronic CVT for optimum efficiency. Combined fuel economy is estimated by the manufacturer to hit 33 mpg. Available features include Apple CarPlay and Android Auto integration, Blind Spot Warning, Rear Cross Traffic Alert, Nissan Intelligent key and much more. Can the 2018 Nissan Kicks compete against other options in the automotive space? Only time will tell. 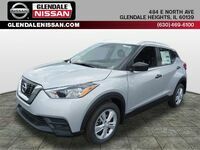 Contact us here at Glendale Nissan for more information on this upcoming CUV.